Jul. 01 /CSRwire/ - Cambridge, MA. - July 1, 2009 - We are distressed to report that on June 14th, conservationist Kuki Gallmann was attacked by poachers on her property in Lakipia, Northern Kenya: http://www.gallmannkenya.org/news.html. The illegal ivory and rhino horn trade is a danger to animals and environmentalists, and is stepping up the stakes of the Conservation Wars underway around the globe. "I was attacked in the Conservancy while alone in my car by seven men on a mission to kill, as a revenge for my involvement in anti-poaching efforts and attempts to break into the illegal ivory and rhino horn trade. I was hit several times, first in the neck, and then the left hand I used to shelter my head was shattered from blows with poles, fence posts and rocks they threw. Miraculously I at last managed to insert the first gear with the good hand and drove over a mile before losing consciousness; when I came to I raised the alarm and help from my security staff and the wonderful and most efficient Kenya Wildlife Services team stationed on the conservancy came immediately to my rescue." A major land steward at the edge of the Great Rift Valley the Ol Ari Nyiro Conservancy encompasses 100,000 acres in Northern Kenya. The conservancy has won many awards for its protection and cultivation of Black Rhino and other species. The conservancy is also a center for community and cultural projects, and hosts many visitors to Kenya every year. "Kenya had burnt all its ivory back in 1989. We personally helped. It was our old Toyota truck which brought the 12 tons of ivory to be burnt in the Nairobi National Park. This bold and brave message, sent to the world, stopped the legal trade on ivory ; for 19 years the poaching was enormously easier to control. All ivory was illegal. Ivory is neither food, medicine nor fuel. It is not an essential commodity. It is the tooth of a majestic animal. It is criminal that the great herds are destroyed to just make bad taste trinkets no one needs, but this is what is happening." This latest attack highlights growing Conservation Wars that are taking place around the globe. Population pressures and shrinking resources have escalated conflicts between environmental and human interests, and while many conservancies now educate local inhabitants in sustainable land management, opportunistic groups continue to engage in poaching and illegal trade. Kenya and Kenya Wildlife Services have been leaders in opposing the illegal ivory trade, but continue to battle encroachers. Only Kenya and Uganda have forbidden game hunting since 1976. Hunting and ivory trade issues should be one of paramount concern to leaders in the responsible travel movement, and should steer the selections of travelers looking for Fair Travel experiences concerned with the welfare of native habitat. 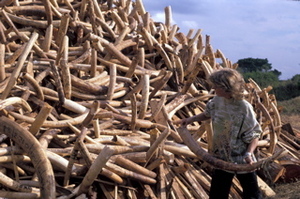 According to Ms. Gallman, the fight against the ivory market was hurt last year by a 2008 CITES (Convention on International Trade in Endangered Species) decision to permit South Africa, Namibia, Botswana and Zimbabwe to sell their stockpiled ivory to China, causing a black market revival on "legal" ivory trade.